When we started hosting and homing elephants at the Elephant Valley Project (aka the EVP ) in Cambodia, visitors actually rode the elephants around so that we could pay for their care. In 2009 we slowly came to realize that the elephants did not like it and so we stopped and started on our quest to build a place that was truly for elephants. Once we had we realized that this was not good for the elephants we started to look more closely at what the elephants wanted and needed rather than what the visitors desired to do with the elephants and this work led the EVP to evolve into a sanctuary for elephants. 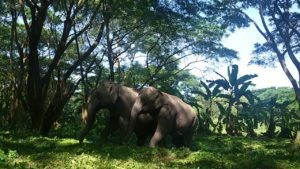 In November 2016 when this elephant sanctuary was ready to open we welcomed four elephants from the Timber Industry to come and live with us. 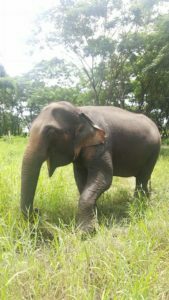 We wanted to let them live straight away with no chains and bullhooks but they have been used to being wrapped in chains and bullied with bullhooks for so long that we found we could not settle them in without unfortunately treating them the same way and then slowly backing away from this traditional style of use and then move them over to more non violent, positive reinforcement based methods. Positive change was achieved in small and steady steps. 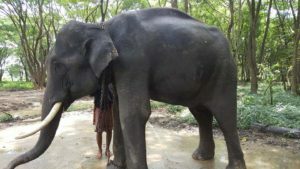 Often visitors to elephant sanctuaries think that you just can take an elephant and throw them into the forest and they will go straight back to being an elephant. Unfortunately this is not the case. Now the elephants are handled non violently and our mahouts have done an excellent job to retrain alongside their elephants. Our latest two rescues have settled in much quicker as the first four elephants have adapted already and new additions learn to copy fast. 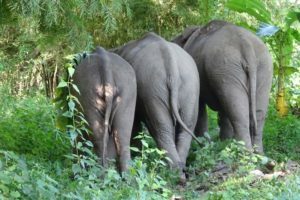 We are very proud of our work to transistion elephants towards a more modern form of handling and now other camp owners, managers and mahouts are regulary visiting our little elephant sanctuary to learn how to do this same work. 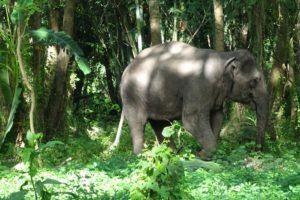 Our elephant sanctuary in Thailand has 15 hectares and is 1% of the size of the sanctuary in Cambodia (which is about 1500 hectares) but the EVT is farmed more intensely with special elephant grasses, banana trees and bamboo. To achieve a higher rate of food production in the dry season our land has an extensive irrigation system that keeps the grasses growing. However the elephants have discovered it can be fun to dig it up and play in the ensuing fountain! Their delight is our maintenance teams headache! This film was taken over the first 3 days the elephants were here and so they do have, in some shots, their drag chains with them though this is certainly not the case now. Come visit and learn more about this fascinating rehabilitative process.